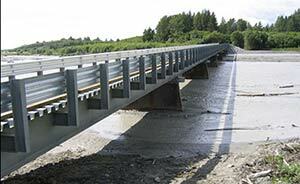 Infrastructure in Alaska often intersects with fish habitat. 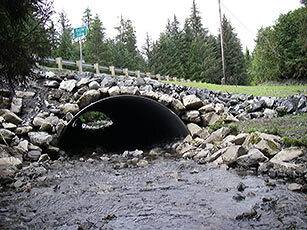 Building and maintaining roads and trails frequently requires the installation of culverts or bridges to cross fish-bearing streams and rivers. Bridges that span the floodplain typically offer the best solution for crossing streams and greatly reduce the potential for the crossing to negatively impact fish habitat or become a fish passage barrier. Bridges generally require less instream maintenance over time, provide less restriction to flow, and maintain stream structure and flow characteristics better than culverts. Properly sized culverts that are designed, installed, and maintained properly can provide a cost effective solution for crossing small streams. 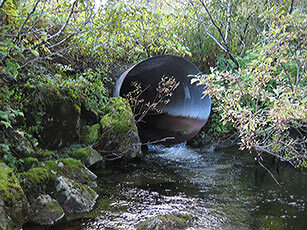 Culverts that are undersized tend to become perched or damaged leading to fish passage issues and increased maintenance costs. Cumulatively, these blockages can have significant negative effects on fish populations in Alaska, and limit access to miles of important spawning and/or rearing habitat. Please contact your local Habitat Division office or visit our Fish Passage Improvement Program for more information on fish passage and how to design a proper crossing structure.